Set the maximum length of a motion to be added to the roadmap. Clear the query previously loaded from the ProblemDefinition. Subsequent calls to solve() will reuse the previously computed roadmap, but will clear the set of input states constructed by the previous call to solve(). 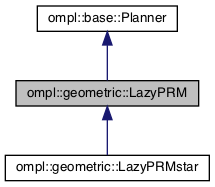 This enables multi-query functionality for LazyPRM. Check if any pair of a start state and goal state are part of the same connected component. If so, return the id of that component. Otherwise, return -1. Access the connected component of a vertex. Access the validity state of a vertex. Access the validity state of an edge. Number of connected components created so far. This is used as an ID only, does not represent the actual number of components currently in the graph. The number of elements in each component in the LazyPRM roadmap. Flag indicating validity of an edge of a vertex. LazyPRM is a planner that constructs a roadmap of milestones that approximate the connectivity of the state space, just like PRM does. The difference is that the planner uses lazy collision checking. Definition at line 73 of file LazyPRM.h. Definition at line 145 of file LazyPRM.h. expect the roadmap to be sparse (m<n^2), an adjacency_list is more appropriate than an adjacency_matrix. We use listS for the vertex list because vertex descriptors are invalidated by remove operations if using vecS. Definition at line 128 of file LazyPRM.h. Definition at line 214 of file LazyPRM.h. Definition at line 190 of file LazyPRM.h.